Summer is almost here and you know what that means – warm weather, cookouts, 4th of July, picnics, potlucks and YES! Ice Cream! 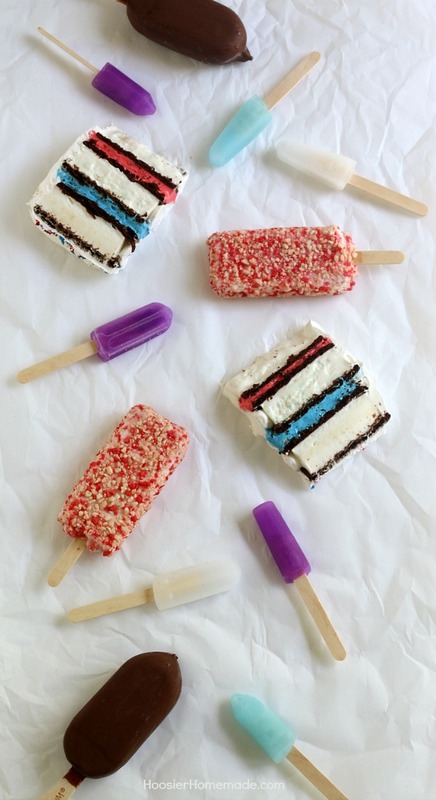 It really doesn’t matter what age you are, I have never met a person that didn’t love ice cream, especially when they are fun ice cream sandwiches, bars, and treats. I know your life is busy. I know your to-do list is never ending. I get it. I’m right there with you! Which is why it’s a goal of mine to create show-stopping desserts that are super easy and use simple ingredients. 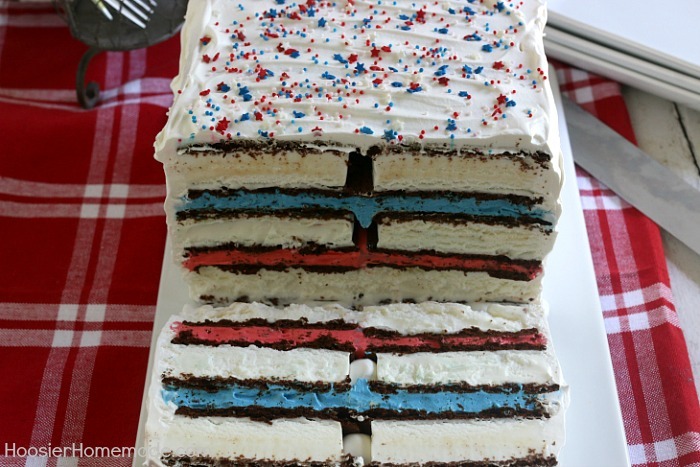 This Ice Cream Sandwiches Cake is just that! 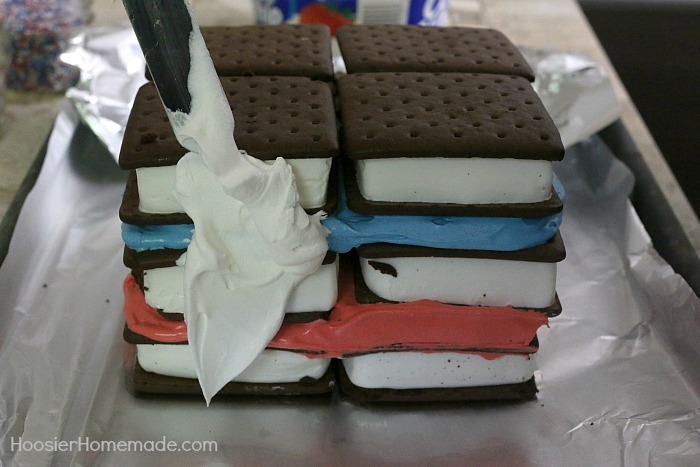 I added blue and red icing in between the layers of Ice Cream Sandwiches, which is perfect for the patriotic holidays coming up – Memorial Day and 4th of July. But honestly, you could add any color you want. Maybe have 1 cake with pink layers, and 1 cake with blue layers for a gender reveal party. How fun! 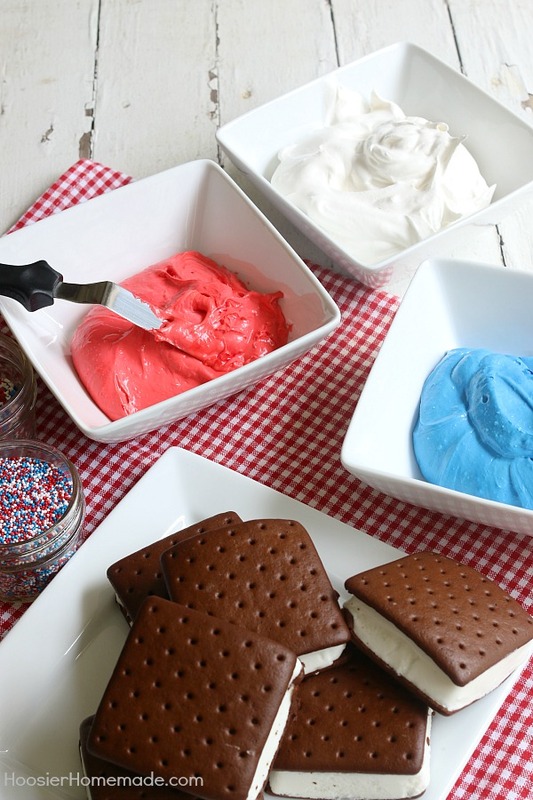 All you need to make this incredible Ice Cream Sandwiches Cake are 5 ingredients – Klondike Ice Cream Sandwiches, whipped topping, marshmallow fluff, pudding, and coloring. Sprinkles are optional, but of course, highly recommended. First, you will need to line a cookie sheet with a sheet of aluminum foil. 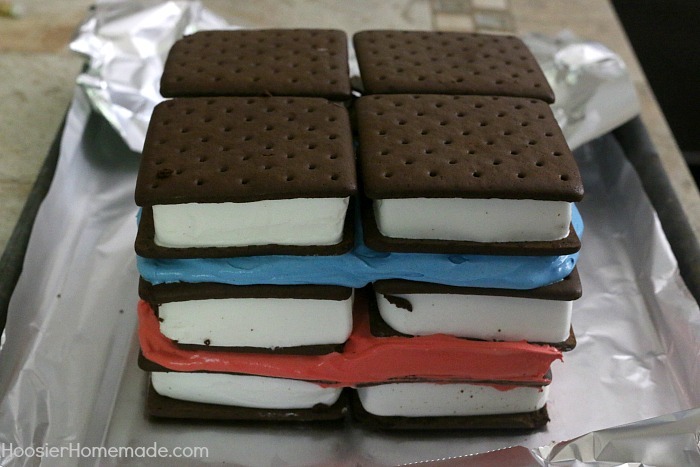 Lay 4 Klondike Ice Cream Sandwiches on the bottom, fitting them together as closely as possible. Then frost the top with the red layer of frosting which is a combination of marshmallow fluff, pudding, whipping topping and paste coloring. Be sure to use No Taste Red Coloring, regular red is really bitter. 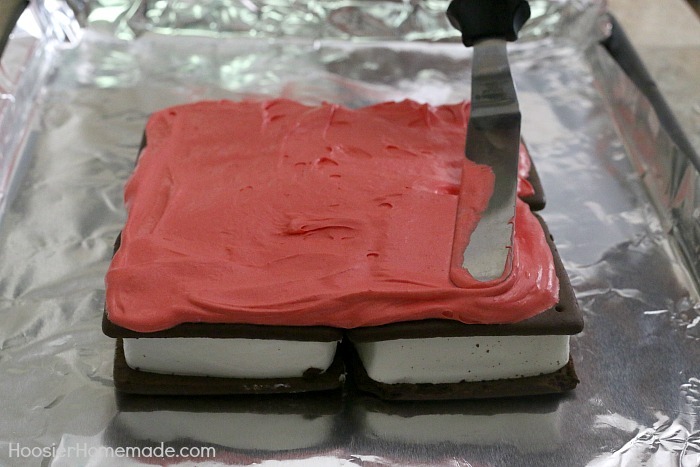 Then add another layer of Klondike Ice Cream Sandwiches, the blue layer of frosting and another layer of ice cream sandwiches. Now, stick the cake into the freezer for about 20 minutes to firm it up. I checked it at about 5 minutes to make sure the layers were not slipping. If your ice cream is still nice and firm, you can begin adding the whipped topping and skip this step. Pull the cake from the freezer and immediately frost with whipped topping. Cover the sides first and then the top. I added a thin layer – kind of like a crumb coat – first, then went back over it again. After all the sides and top are frosted, back into the freezer it goes for at least 4 hours, or overnight. Before serving, add sprinkles if you like – of course, who doesn’t like sprinkles. I used festive red, white and blue mini stars and nonpareils. I can just hear the sound of the Ice Cream Truck coming down the street, that all too familiar jingle still rings in my head. How about you? In the photo are – Magnum Double Raspberry Bars, Frozen themed Mini Popsicles (how cute are those?! ), the Ice Cream Sandwiches Cake and Good Humor Strawberry Shortcake Ice Cream Bars. The Strawberry Shortcake Bars bring back lots of memories. During my pregnancy with my middle son, those are what I craved. 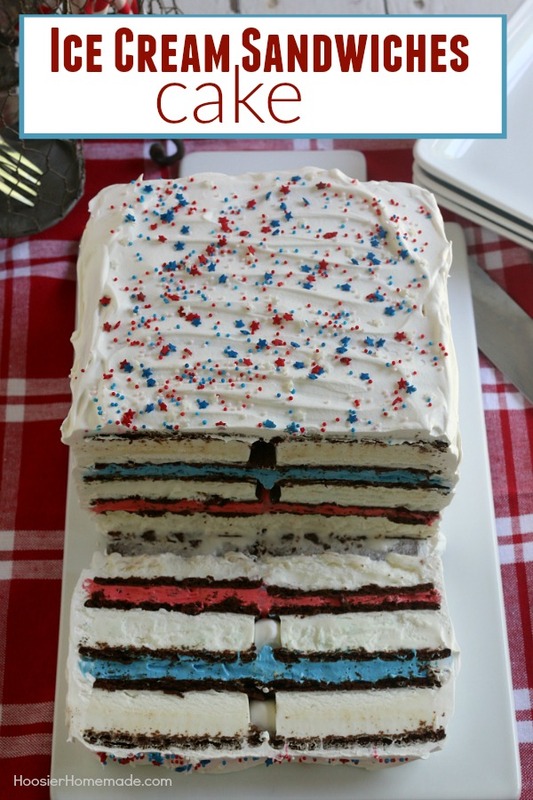 This fun red, white and blue ice cream sandwiches cake is super easy and really fun for your 4th of July Celebrations! Just 4 simple ingredients and you have a show-stopping dessert! This looks awesome! I have a question about the whipped topping. Do you use one container to mix with the fluff and pudding and one for the top and sides? Recipe isn’t clear. Yes- that is correct! I changed the recipe to reflect that- thanks so much! Hi just stopping by to let you know that this fabulous post was picked as one of the feature posts on the #HomeMatters linky party this week. You can check it out at http://adventuresfrugalmom.com/home-matters-linky-party-91/. While you are there make sure to grab the I was featured button for your sidebar. Congrats and thanks for linking up. Hope you will continue to link up. Your cake is so pretty and looks so delicious! 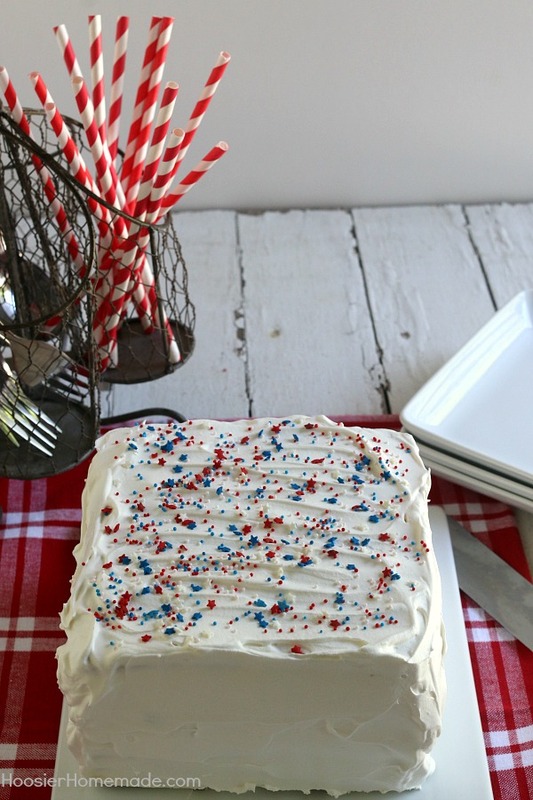 Great way to add a festive dessert to a 4th of July cookout this year. Thank you for sharing at Merry Monday! This looks easy and delicious! Thanks for sharing at Creativity Unleashed Link Party. I love the easy and “wow” factor of an ice cream sandwich cake. 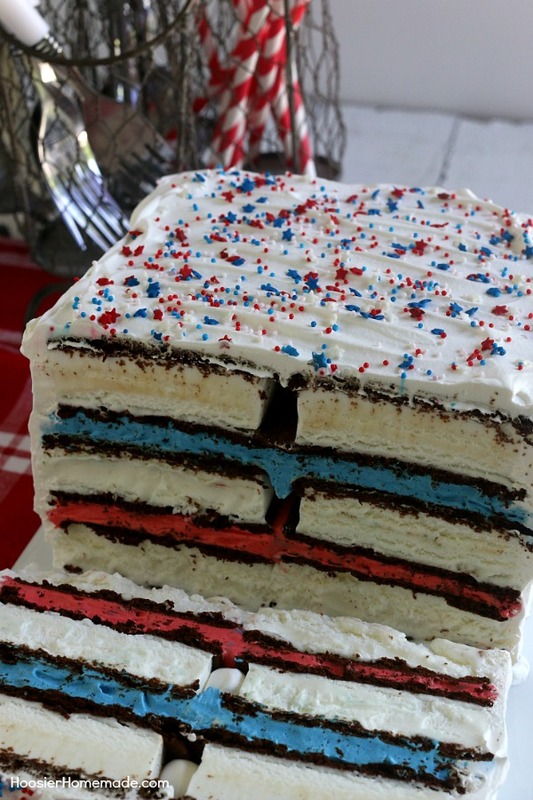 The colored filling in your cake is so much fun and perfect for a patriotic celebration. This is genius! Looks delicious, too! Looks delicious and so easy to put together. Perfect for the summer holiday parties coming up! Thanks! I love that it is totally customizable!